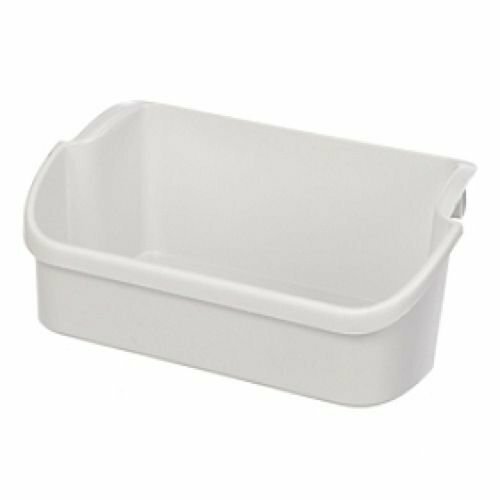 240338201 Genuine OEM Frigidaire Door Bin Shelf This bin is a genuine Frigidaire part and fits specific Frigidaire-built refrigerators, including some Kenmores. May fit other brands. White in color Measures about 14 inches wide by 5 inches high by 7-1/2 inches deep.Genuine Frigidaire PartReplaces or can be used instead of AP2115861, 917180, AH429876, EA429876, PS429876, and others.- Generic versions of this part do not hold up to weight as well as the genuine one; buy only genuine parts and keep your fridge 100% original! If you have any questions about this product by Refrigerator Gallon Bin Door Shelf, contact us by completing and submitting the form below. If you are looking for a specif part number, please include it with your message.